1. Fasting is compulsory for those who are mentally and physically fit, past the age of puberty, in a settled situation (not traveling), and are sure that such fasting is unlikely to cause real physical or mental injury. 9. Those who are temporarily unable to fast must make up the missed days at another time or feed the poor. 10. During Ramadan there are special prayers, also called taraweeh, performed daily after the night time prayer, also called isha prayer. 11. Lailat ul-Qadr (“Night of Power” or “Night of Destiny”) marks the anniversary of the night on which the Prophet Muhammad first began receiving revelations from God, through the angel Gabriel. Muslims believe Lailat ul-Qadr is one of the last odd-numbered ten nights of Ramadan. 14. Social visits to open the fast with a shared meal are encouraged. 16. Eid begins with special morning prayers on the first day of Shawwal, the month following Ramadan on the Islamic lunar calendar. 17. It is forbidden to perform an optional fast during Eid because it is a time for relaxation. spirituality. 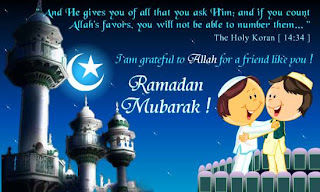 Muslims also appreciate the feeling of togetherness shared by family and friends throughout the month. Perhaps the greatest practical benefit is the yearly lesson in self-restraint and discipline that can carry forward to other aspects of a Muslim’s life such as work and education. 20. The Quran is the record of the exact words revealed by God through the Angel Gabriel to the Prophet Muhammad in Arabic. It was memorized by Muhammad and then dictated to his companions. The text of the Quran was cross-checked during the life of the Prophet. The 114 chapters of the Quran have remained unchanged through the centuries.Translations of the meaning of the Quran exist in almost all languages. a) The Declaration of Faith - This consists of the two sentence declaration described above. b) Prayer - Muslims perform five obligatory prayers each day. Islamic prayers are a direct link between the worshiper and God. Islam has no hierarchical authority or priesthood. A learned Muslim chosen by each congregation leads the prayers. c) Zakat -One of the most important principles of Islam is that all things belong to God and that wealth is held in trust by human beings. Zakat, or charitable giving, “purifies” wealth by setting aside a portion for those in need. This payment is usually two and a half percent of one’s capital. d) Fasting - Every year in the Islamic lunar month of Ramadan, Muslims fast from first light until sunset. The fast is another method of self-purification. e) Pilgrimage - A pilgrimage to Mecca, or Hajj, is an obligation for those who are physically or financially able. 22. Jihad does not mean “holy war.” Literally, jihad means to strive, struggle and exert effort. It is a central and broad Islamic concept that includes struggle against evil inclinations within oneself, struggle to improve the quality of life in society, struggle in the battlefield for self-defense (e.g.,having a standing army for national defense), or fighting against tyranny or oppression.